So you think Black Friday is a shopping experience? To me, it’s just a feeding frenzy. If Sam Walton has been successful at anything, it has been getting us to focus on price. I sort of liked the world better before Walmart. In those days price was certainly a factor, but it wasn’t the only factor. Designer names were guideposts, not a decoration plastered across the seat of a pair of sweat pants. Developing your own style was more important than being in style. In other words, going shopping was about more than consuming. A perfect example of this was Neiman Marcus Fortnight. During a two week period in the fall, Neiman’s would transform their Dallas stores into reasonable facsimiles of some exciting destination. 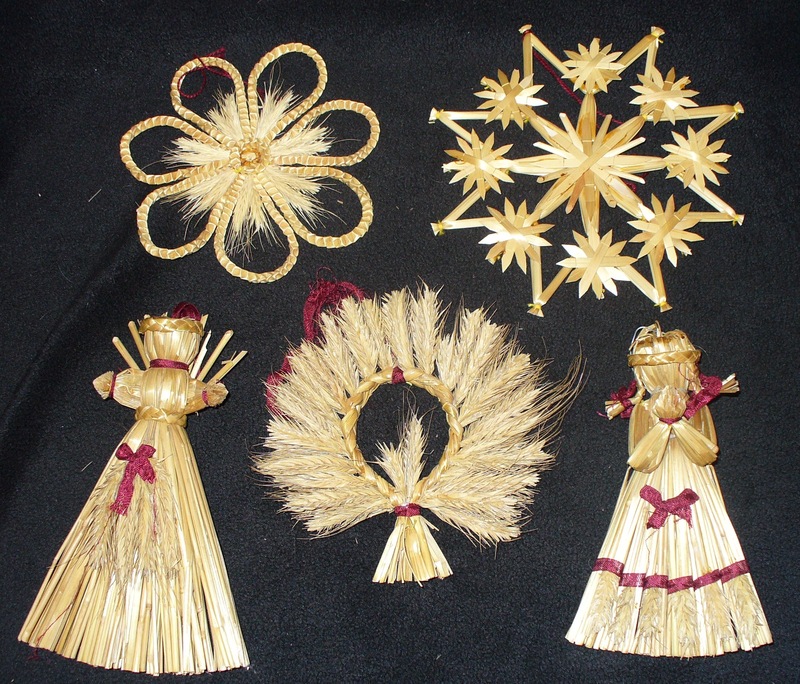 The straw ornaments above are from Bavaria and were purchased in 1983 during the German Fortnight. D Magazine gives you the details of Fortnight, but I want to convey the experience. For a middle-class kid living in Dallas in the Sixties, Fortnight was a window to the wider world. On a special evening, Mom would dress us up in the our best. The minute Dad got home from work he’d load us in the car and take us to Neiman’s flagship store in downtown Dallas – but it didn’t seem like a store at all. In fact, once I entered Neiman’s, I felt as if I’d stepped off a plane into a faraway place. In additon, Mother took us shopping at Neiman’s all year long, so we’d know the latest in fashion and appreciate quality. Then we’d go to Titche’s and buy our wardrobes with Mom’s employee discount. But a splashy ad in the Dallas Morning News Neiman’s would announce our Fortnight destination and I’d be giddy for weeks until our annual Fortnight visit was scheduled. During Fortnight, we’d wander through the retail wonderland all agog. The ultimate treat was dinner at one of the NM cafes tricked out like the featured locale and serving their traditional fare. Along with many items from the featured country for sale, each floor of Neiman’s hosted special exhibits and demonstrations. We’d watch traditionally garbed dancers perform exotic dances. We’d see animals, artisans and actresses. Our family added very little to Neiman Marcus’s bottom line during this annual pilgrimage, but Fortnight was such a retail success, in spite of folks like us, that many stores attempted copy cat experiences. Yes, shopping was fun back in those days. During the years I was busy going to school and living the disco scene, Neiman’s sort of fell off my radar. Then I became an official consumer with a credit rating. A Neiman Marcus charge card provided a plastic invitation to another world. Among the most important privileges offered was postal delivery of the famous Neiman Marcus Christmas Catalog with its legendary His and Hers gifts of opulence. Trust me, nothing on the internet can replace that catalog. The recipient of a gift, in the store’s traditional shiny red Christmas box with the gold Neiman Marcus logo, expected no additional wrapping paper and bows. Adulthood arrived when I received my own Neiman Marcus credit card. I have to confess I did not inherit my parent’s frugality. I found it impossible to merely visit Fortnight and buy nothing but dinner. I went to the store as often as I could during those special two weeks to buy myself and others as many little treats as I thought I could get away with. Being at Fortnight was one of those particularly Dallas experiences, like visiting the Great State Fair of Texas or seeing the Christmas decorations on Beverly Drive. Now Neiman Marcus has stores all over the world and they belong to some big corporation – not Mr. Nieman and Mr. Marcus. Most middle class kids in Dallas have flown somewhere before they reach their sixth birthday. Someone took Fortnight out of the Neiman Marcus budget, but I miss it. I still have my Neiman Marcus credit card and it gets plenty of use. Neiman’s is my luxury store of choice. Having lunch at Neiman’s is one of my favorite indulgences. I will always love giving gifts wrapped in nothing but a Neiman’s logo. Nowadays I shop at Neiman’s and buy my wardrobe at the Allen Outlet Mall, because even though Mom retired with her discount intact, department store shopping isn’t as much fun as it used to be. Drat that Mr. Walton. Previous postCan You Say Tlaquepaque and Oberammergau? The German Fortnight was my favorite. Thanks so much for dropping by. I concur with you on every point. I didn’t know about this. But I do love getting NM catalog every Christmas! Great to hear from you Donna. I love me some Neiman Marcus! What wonderful memories you evoke of Fortnight! I also remember the very special packages that would arrive with those little Neiman’s butterflies– I suppose the Mariposa Room at Willow Bend recalls them. I also remember Neiman’s in Preston Center at Christmas; the Christmas display outside in the back of the store was a winter wonderland.